Catherine was waiting on pins and needles for Michael to pop the question after ring shopping. After almost five years of dating, Michael picked a day to surprise her at her apartment in Richmond after telling her he would be working in Radford all weekend. She knew immediately that the moment she'd been waiting for was finally happening. The couple took a short vacation in the Outer Banks, NC to celebrate the proposal. 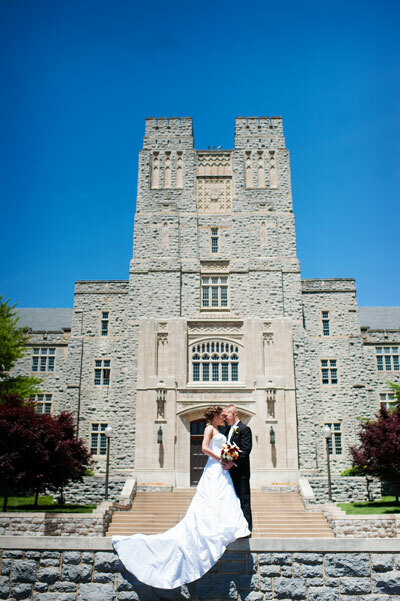 Both Michael and Catherine being Virginia Tech alumni, there was no question that the theme of the wedding must be centered around their alma mater. The wedding colors were maroon and orange, which could be seen in everything from the bridesmaids' gowns to the flower arrangements and even Catherine's garter. The ceremony also had special elements such as the pastor's special speech about traditional wedding traditions. To keep things personal, the music choices were all favorites of the couple, their parents, and family friends. Additionally, Michael and Catherine honored military and emergency response members, donated to the Marching Virginians in honor of Ryan Clark and the Officer Deriek Crouse fund in place of favors, and donated the centerpieces to a local nursing home in honor of Catherine's Pop Pop. 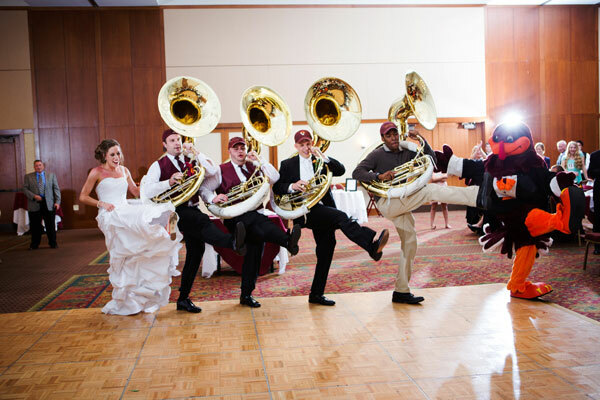 In keeping with their love of Virginia Tech, the Hokie Bird made an appearance to entertain guests during the reception. Be sure to see the Mansdoerfer wedding on page 36 of the third issue of bridebook!